Choir Directors, also known as music directors or choral directors, often handle various aspects of instrumental and vocal of choirs, glee clubs or ensembles. Some of the job tasks mentioned in the Job description template of the choir directors are – composing music, performing administrative tasks, leading performances, composing and leading performances, selecting music, choosing singers for solos and groups, conducting rehearsals, choosing accompanists, maintaining calendar events, recruiting new members, ensuring uniformity of group performance members attire, and managing the budget of the choir. 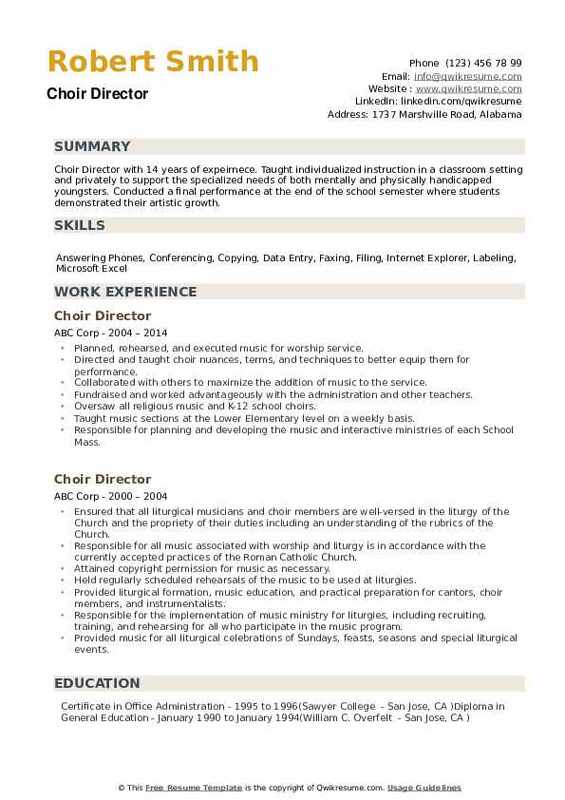 A choir director, at the first place, should be a skilled musician and depict experience in music directing and be able to read and understand music details, they must also be familiar in conducting techniques and have a deep understanding of music styles which may include knowledge of music history and the encompassing repertoire. Formal education in music with demonstrable experience in the field is expected to be seen on the Choir Director Resume. Summary : Self-driven Choir Director experienced in the fields of Religion, Education, Writing, and Business, who flourishes in diverse, multicultural environments and is passionate about sharing knowledge and experience. I aim to promote leadership, cohesiveness, passion, and excellence on different levels. Training and directing the volunteer Church singers to perform multi-lingual acapella music. Instructing Cantors to execute chant in proper order in accordance with the Typikon of the Church. Engaging adults and children in interactive learning of singing techniques and order of services. Designing and teaching the structure of liturgical services, hymnology, Church history, and scripture at parish adult education classes. Responsible for leading and developing the parish liturgical music program. Researching, compiling, arranging liturgical music and texts, and publishing 15 distinct services. Orchestrating the online resources of liturgical music in several languages. Working with a widely diverse group of singers and members of the congregation. 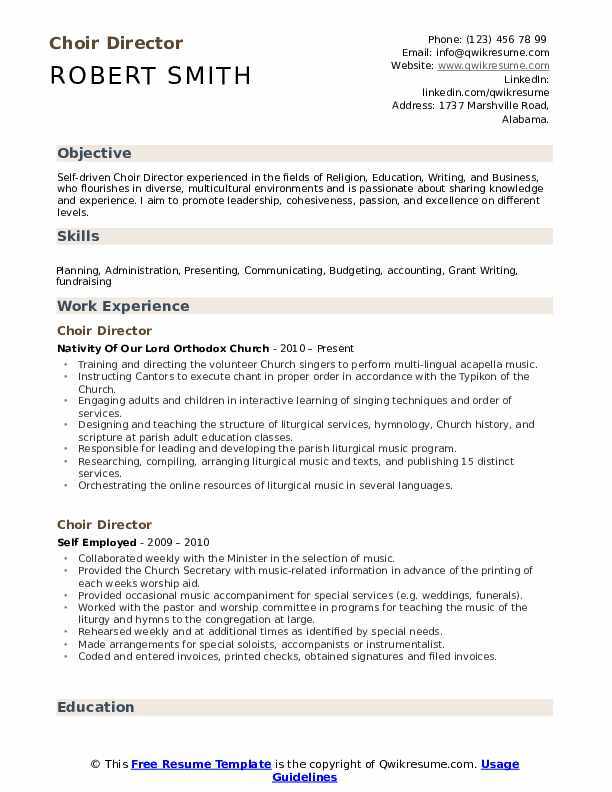 Headline : A self-motivated, enthusiastic Choir Director and lifelong learner eager to apply a unique combination of experience in education, world travel, and leadership to a position in international education. 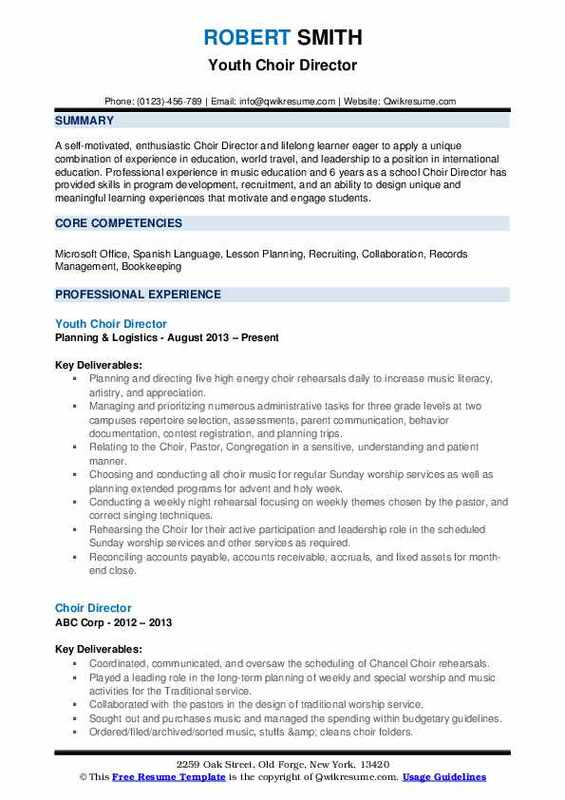 Professional experience in music education and 6 years as a school Choir Director has provided skills in program development, recruitment, and an ability to design unique and meaningful learning experiences that motivate and engage students. Planning and directing five high energy choir rehearsals daily to increase music literacy, artistry, and appreciation. Managing and prioritizing numerous administrative tasks for three grade levels at two campuses: repertoire selection, assessments, parent communication, behavior documentation, contest registration, and planning trips. Relating to the Choir, Pastor, Congregation in a sensitive, understanding and patient manner. Choosing and conducting all choir music for regular Sunday worship services as well as planning extended programs for advent and holy week. Conducting a weekly night rehearsal focusing on weekly themes chosen by the pastor, and correct singing techniques. Rehearsing the Choir for their active participation and leadership role in the scheduled Sunday worship services and other services as required. Reconciling accounts payable, accounts receivable, accruals, and fixed assets for month-end close. 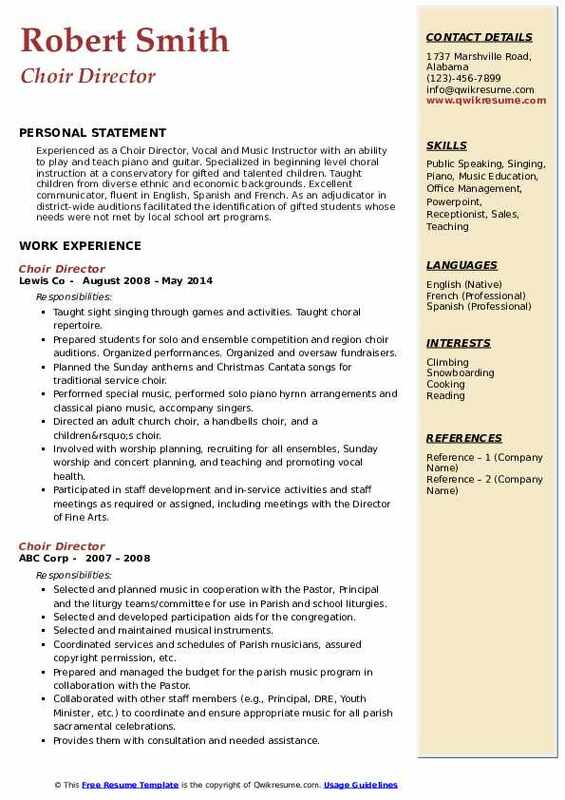 Objective : Choir Director passionate about teaching high-quality music and encouraging students to engage and thrive in their musical development. I want to inspire students to reach beyond just singing in the shower and so they can see the potential to make a career in any sector of music, choir or otherwise. Conducting choir for liturgical services, communicating clearly about repertoire for present and future services, teaching and instructing choir to improve quality of sound and unity of members, mental concentration and focus. Finding and choosing appropriate repertoire for choir and for specific services. Planning out a timeline for new repertoire to learn in rehearsals depending on the church. Demonstrating the ability to see the needs and wants of the choir and specific choir members and discerning what should be or shouldn't be done to meet these needs. Selecting music suitable for the level of the choir serves as an example of appropriate behavior and spirituality. Internally motivated positive feedback from parents and administration. Helping educate and train teachers on making documents fully accessible for students and parents. Objective : Choir Director recognized for training, building curriculum, implementing programs, and exceeding goals and objectives using a foundational teaching pedigree focused on music, performance, and inclusion. Known as a disciplined and trustworthy leader, coach, and mentor who delivers constructive and non-threatening feedback in environments that demand a tactical and strategic approach to consulting, creative teamwork, and leading students to excel and reach their full potential. Implemented plans by ordering needed materials, scheduling speakers, reserving space, and handling other administrative details. Counseled individuals regarding interpersonal, health, financial, and other problems. Scheduled special events such as camps, conferences, meetings, seminars, and retreats. Located and distributed resources, such as periodicals and curricula, to enhance the effectiveness of educational programs. Supervised workers, trained staff members to perform various skills. Developed promotional strategies. Provided weekly rehearsals and creates weekly programs. Organized bilingual programs with the Spanish Mass Director during holidays such as Thanksgiving, Easter, and Christmas. Responsible for recruitment of new members. Created original arrangements for the choir based on need. 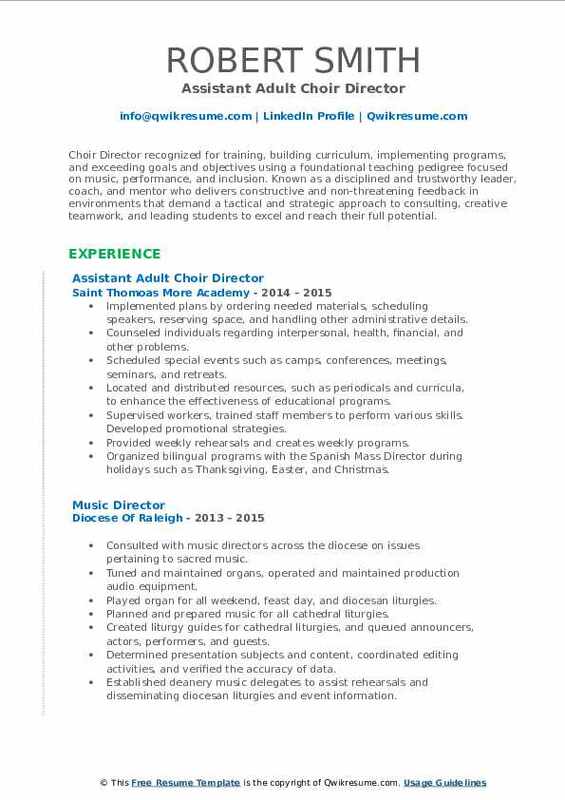 Objective : Choir Director with a passion for organizing and working with people is driven by a deep desire to serve and create a better world. Developed a life-long love of learning, always pushing to learn and expand my scope of influence. I think strategically, work efficiently, and take pride in providing high-quality service. Gained and maintained accountability in program success while creating curriculum changes directly leading to program growth year over year. Conducted and led the choir, trained the choir members to set a time schedule for rehearsals, supervise and led choir rehearsals. Researched songs that the choir is capable of performing and adjust songs to fit choir. Directed events such as choral festivals and concerts with the aid of a parent board. Directed a chamber choir of 5th to 10th grade girls as part of a choir camp that included private vocal coaching, team building, music theory training, intensive choral rehearsals and culminated in a concert. Taught large groups of 6th-12th-grade students how to read and perform choral music. Coordinated with different departments and offices within the school for events/galas featuring the performing arts students. Coordinated with other performing arts teachers to organize festivals to feature the students work. 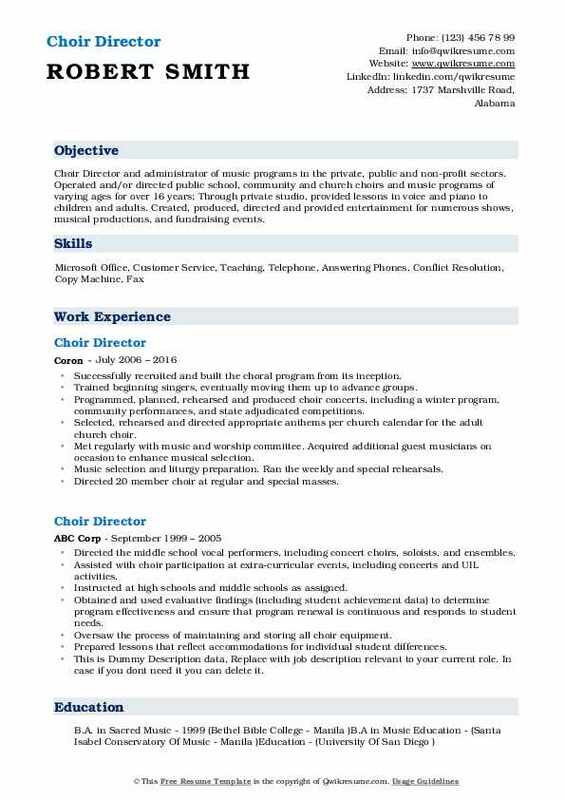 Summary : Choir Director and administrator of music programs in the private, public and non-profit sectors. Operated and/or directed public school, community and church choirs and music programs of varying ages for over 16 years; Through private studio, provided lessons in voice and piano to children and adults. Created, produced, directed and provided entertainment for numerous shows, musical productions, and fundraising events. Successfully recruited and built the choral program from its inception. Trained beginning singers, eventually moving them up to advance groups. Programmed, planned, rehearsed and produced choir concerts, including a winter program, community performances, and state adjudicated competitions. Selected, rehearsed and directed appropriate anthems per church calendar for the adult church choir. Met regularly with music and worship committee. Acquired additional guest musicians on occasion to enhance musical selection. Music selection and liturgy preparation. Ran the weekly and special rehearsals. Directed 20 member choir at regular and special masses. Supervised musicians. Fostered and developed individual members musical abilities. Recruited new choir members. Planned workshops. Attended staff meetings. 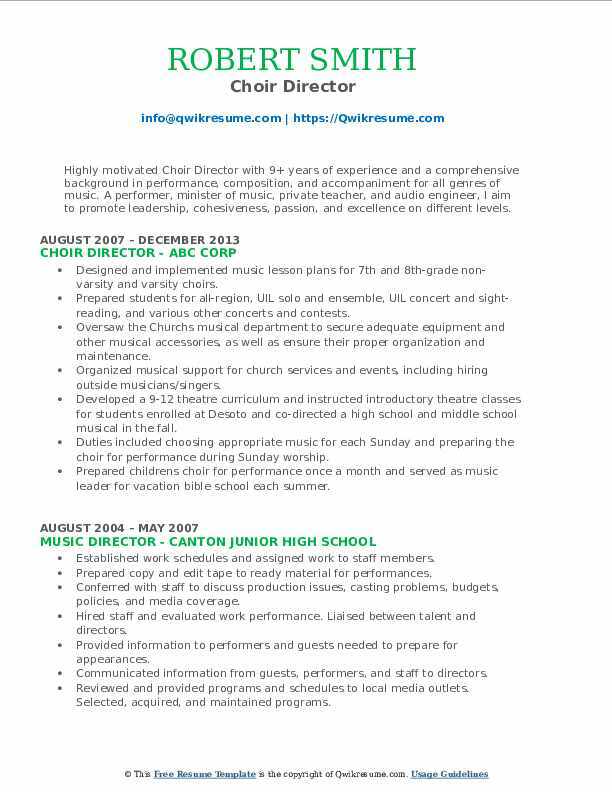 Summary : Highly motivated Choir Director with 9+ years of experience and a comprehensive background in performance, composition, and accompaniment for all genres of music. A performer, minister of music, private teacher, and audio engineer, I aim to promote leadership, cohesiveness, passion, and excellence on different levels. Designed and implemented music lesson plans for 7th and 8th-grade non-varsity and varsity choirs. Prepared students for all-region, UIL solo and ensemble, UIL concert and sight-reading, and various other concerts and contests. Oversaw the Church's musical department to secure adequate equipment and other musical accessories, as well as ensure their proper organization and maintenance. 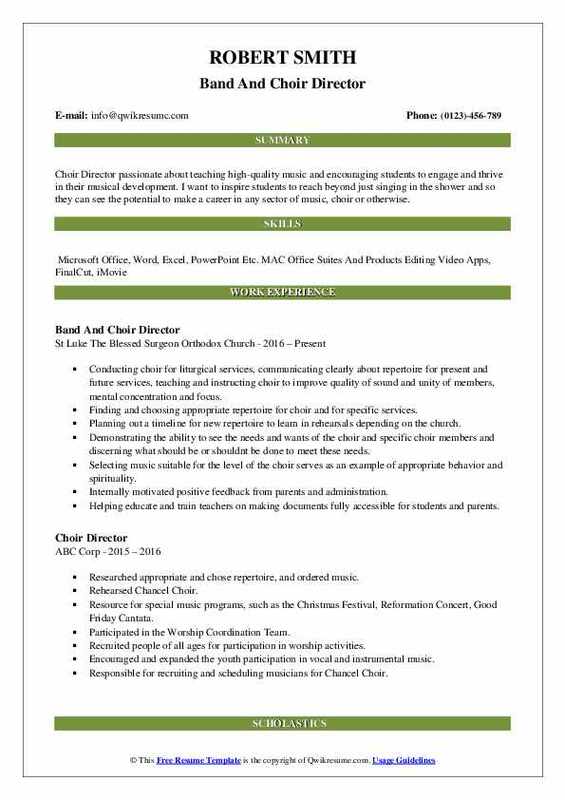 Organized musical support for church services and events, including hiring outside musicians/singers. Developed a 9-12 theatre curriculum and instructed introductory theatre classes for students enrolled at Desoto and co-directed a high school and middle school musical in the fall. Duties included choosing appropriate music for each Sunday and preparing the choir for performance during Sunday worship. Prepared children's choir for performance once a month and served as music leader for vacation bible school each summer. Summary : An enthusiastic and experienced Choir Director skilled in fostering both the academic and artistic development of students of various ages and backgrounds. Specialized in music production, but skills are transferable to settings that require cross-functional collaboration and effective leadership. Rehearsed the choir for their active participation and leadership role in the scheduled Sunday worship services and other services as required. Worked with the Pastor and worship committee in programs for teaching the music of the liturgy and hymns to the congregation at large. Rehearsed weekly and at additional times as identified by special needs. Made arrangements for special soloists, accompanists or instrumentalist. Conducted weekly rehearsals in preparation for Sunday morning worship services at 10 am on 3rd Sundays and 8 am and 11 am on 5th Sundays. Assisted the Pastor by creating an atmosphere conducive to worship and minister. Led district-wide training on implementing technology into teaching. 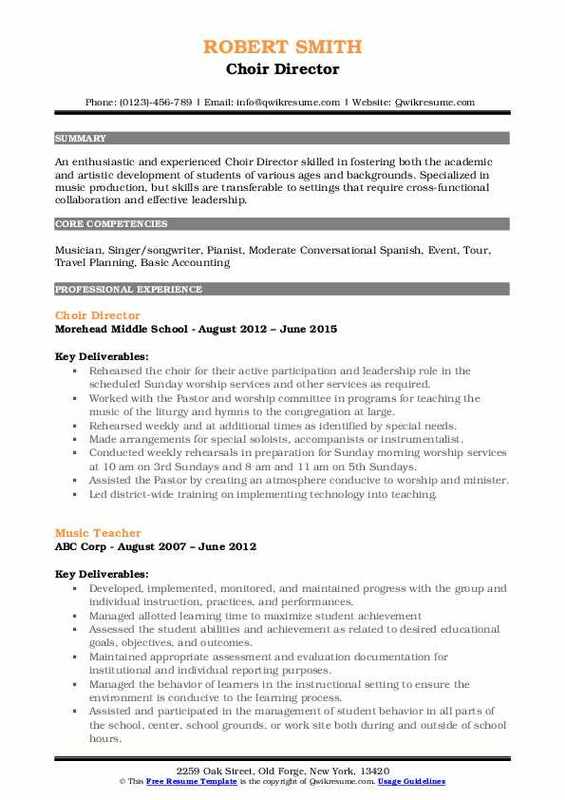 Summary : Experienced as a Choir Director, Vocal and Music Instructor with an ability to play and teach piano and guitar. Specialized in beginning level choral instruction at a conservatory for gifted and talented children. Taught children from diverse ethnic and economic backgrounds. Excellent communicator, fluent in English, Spanish and French. As an adjudicator in district-wide auditions facilitated the identification of gifted students whose needs were not met by local school art programs. Taught sight singing through games and activities. Taught choral repertoire. Prepared students for solo and ensemble competition and region choir auditions. Organized performances. Organized and oversaw fundraisers. Planned the Sunday anthems and Christmas Cantata songs for traditional service choir. Performed special music, performed solo piano hymn arrangements and classical piano music, accompany singers. Directed an adult church choir, a handbells choir, and a children’s choir. Involved with worship planning, recruiting for all ensembles, Sunday worship and concert planning, and teaching and promoting vocal health. Participated in staff development and in-service activities and staff meetings as required or assigned, including meetings with the Director of Fine Arts. 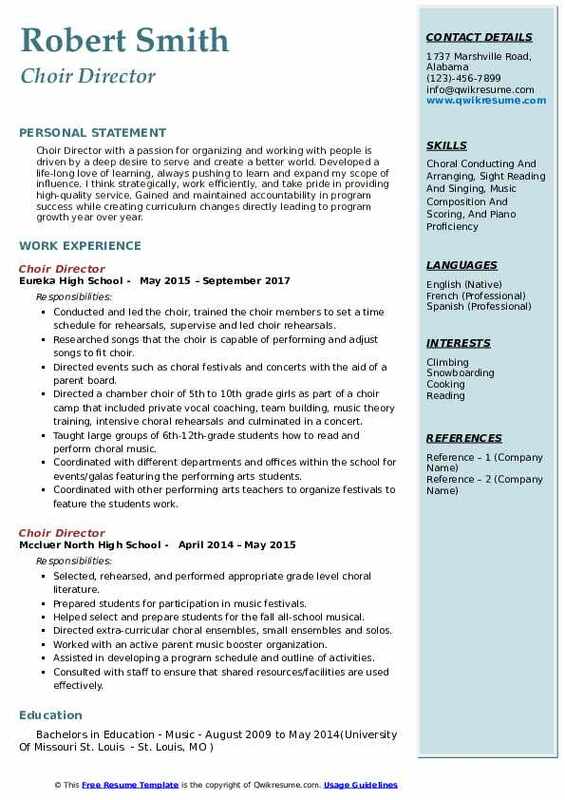 Summary : Choir Director with 14 years of expeirnece. Taught individualized instruction in a classroom setting and privately to support the specialized needs of both mentally and physically handicapped youngsters. Conducted a final performance at the end of the school semester where students demonstrated their artistic growth. Planned, rehearsed, and executed music for worship service. Directed and taught choir nuances, terms, and techniques to better equip them for performance. Collaborated with others to maximize the addition of music to the service. Fundraised and worked advantageously with the administration and other teachers. Oversaw all religious music and K-12 school choirs. Taught music sections at the Lower Elementary level on a weekly basis. Responsible for planning and developing the music and interactive ministries of each School Mass. With the cooperation of staff created a campus-based choir program. Continually researched, developed and mastered new music.